With Fiona Craul & Susan Dempsey of Sweetspot Sourcing (Naas), and Sue O’Neill (Sallins) of the Small Firms Assoication. 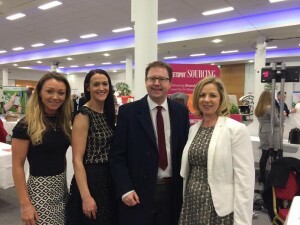 As Fianna Fáil Technology spokesperson I met with a number of Kildare firms in the RDS this week inculding Ventac, Sweetspot Sourcing and Sea Change who were all showcasing their businesses with the Small Firms Association. It is very encouraging to see such talented businesses all based in Kildare, including two from Naas. These businesses are all models of innovation, entrepreneurship and making things happen. It was a pleasure to listen to them and take away their ideas for any further policy initiatives. I was delighted to speak with Fiona Craul and Susan Dempsey of Sweetspot Sourcing, a manufacturing company. With offices in Naas & China their business is a shining example of the success small firms in Kildare can have. Lastly I want to congratulate local Sallins woman Sue O’Neill, the recently elected national Chair of the Small Firms Association. The day was a great success which is a credit to her organisation and leadership on the day of the exhibition. I am certain the direction of the Small Firms Association is in safe hands with Sue.